For over 20 years, ThunderDome Racing Entertainment & Attractions has been providing high quality event entertainment and racing game rentals for events in the Florence SC area. We have worked with countless well-known clients providing high quality entertainment for corporate events, group events, company parties, conventions, trade shows, and hospitality tents nationwide. From video game and arcade game rentals to our awesome racing games and simulators, ThunderDome will work with you or your meeting planner to make your next party a huge success! Unique Racing Games for Your Florence SC Event! 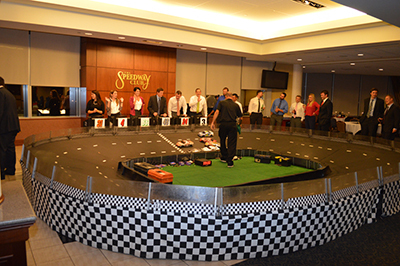 From elaborate stock car race tracks to fun and competitive pit stop challenges, ThunderDome Racing Entertainment & Attractions has everything you need to make your event an exciting experience to remember. We offer custom branding opportunities, prize giveaways, engaging competitions, and a collection of unique racing games and challenges you won't find anywhere else! 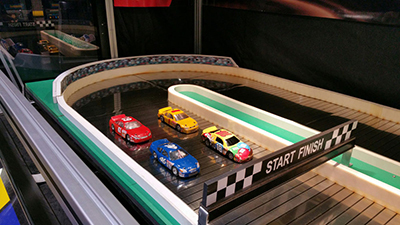 ThunderDome Racing offers a 6-Car Remote Control Race Track, our most engaging attraction, which allows 6 people to compete against one other at one time! 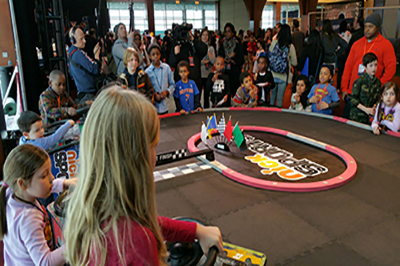 This is a super cool R/C Track and we use it a lot for trade shows and promotions. We can also make customized car bodies or print full track skirts with your company's logos. 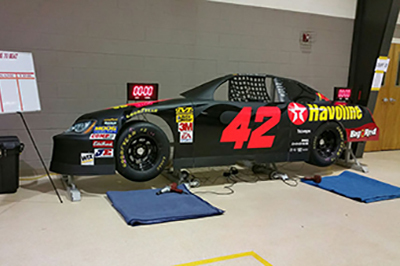 This tire-changing device simulates the fast-paced experience that actual race car pit crew members go through during every NASCAR race! Our Dual Pit Stop Challenge is a great team building attraction that will get your colleagues adrenaline going as they try to beat each other's times! 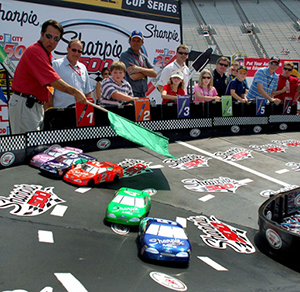 The Stock Car Challenge works just like the 4 Car Mini Track, except it has a smaller footprint for space-challenged venues.